Organica Water is a global provider of innovative solutions for the treatment and recycling of wastewater. Over the past two decades Organica has developed a truly unique approach, enabling customers all over the world to address urban water challenges in a cost efficient manner. Organica’s Scallop discfilter is a mechanical cloth filtration device specially designed to remove suspended solids. Designed as an “inside-out” system, water flows into the Scallop discfilter feed pipe and through openings into the discs mounted on the feed pipe. As the influent flows through the filter panels, suspended solids collect on the filtration media surface. The solids accumulate and generate headloss, which causes the feed pipe water level to rise until hitting a set point, triggering the automated backwash cycle. 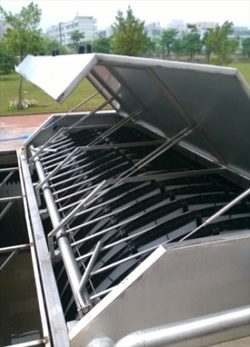 During backwash, the accumulated solids are washed from the rotating discs into the sludge trough by a small portion of the filtered water under pressure. Filtration is continuous even during backwash, and the design of the discfilter enables water to gravity flow through the whole system, minimizing pumping energy. With its advanced design and high-surface area scalloped filter panels, the Organica Scallop discfilter has an exceptionally small physical footprint, reducing land requirement by 90% in comparison to conventional secondary clarification. Organica Scallop discfilters are able to meet performance requirements of a wide range of effluent TSS limits, including constantly producing reuse-quality water. Reclaimed water can be utilized for a number of purposes, including irrigation, industrial cooling processes, feeding A/C cooling towers, toilet flushing or groundwater recharge.